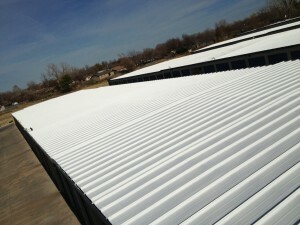 SureCoat Systems has roofs throughout the Midwest standing up to Hail Storms and Torrential Rains! Every year the Midwest is affected by hail storms. If you are a property owner in the Midwest, you may know just how costly and inconvenient the effects of hail damage can be to your building and even your daily business operations. During storm and hurricane season, hail and rust damage can become a costly expense to property owners. The roof is one of the most affected areas of the building during a hail storm. Older and weathered roofs are more susceptible to hail damage than newer or well-maintained roofs. The cost and inconvenience to have your roof replaced due to hail damage can contribute to damaged assets, loss of tenants or even the closing of the business. Many property owners and contractors have already discovered a product that can stand up to the harshest weather conditions and hail storms, SureCoat! The SureCoat Roof System is a fully adhered reconditioning system used to repair and restore Metal, Asphalt Bitumen and Single-Ply roofs with hail damage. 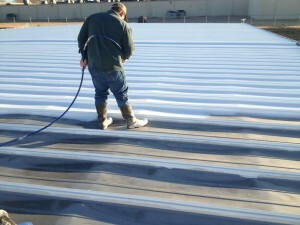 In Edmond, Oklahoma, the SureCoat Roof System was used to repair hail damage over 71,000 s.f. 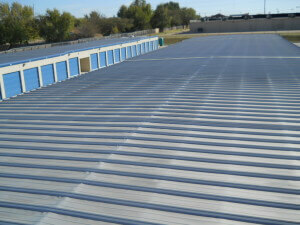 of standing seam metal roofing! 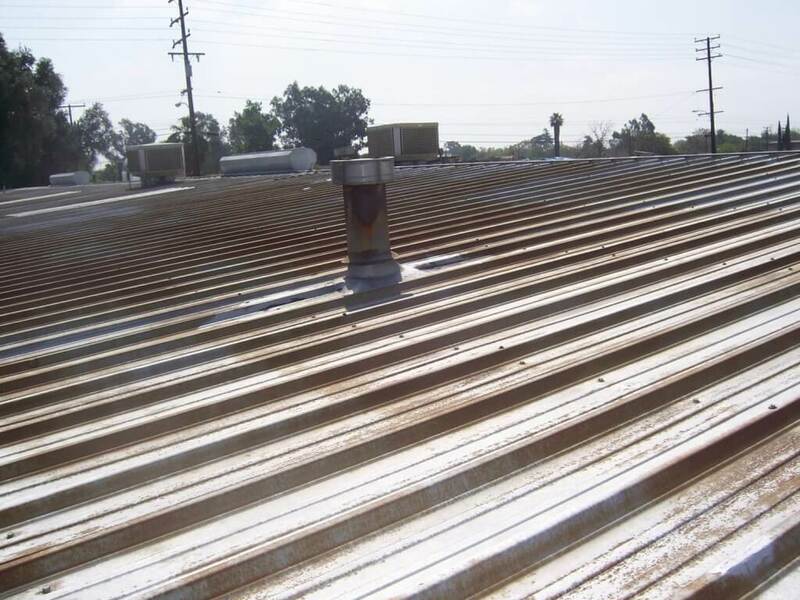 SureCoat was specified as the solution for this project because of its superior adhesion to metal, ability to neutralize rust and additional hail resistance that SureCoat adds to a roof. SureCoat has excellent adhesion to all types of metals including Kynar, aluminum, sheet metal and galvanized steel. 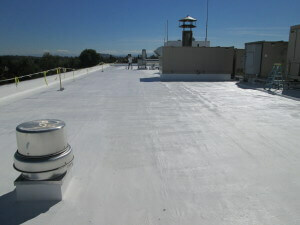 SureCoat is an impermeable elastomeric coating that cures into a seamless membrane. Unlike traditional Single-ply roof overs, the SureCoat Roof System contours to the roof even in areas where reinforcement is required. The SureCoat Roof System fully encapsulates the metal preventing future rust and increasing hail resistance. 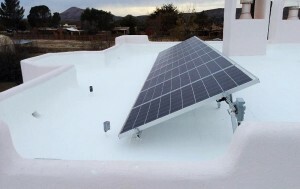 In Las Cruces, New Mexico, the SureCoat Roof System is being used to recondition built-up Cap Sheet roofing with hail damage. 100,000 s.f. and counting in 2016! 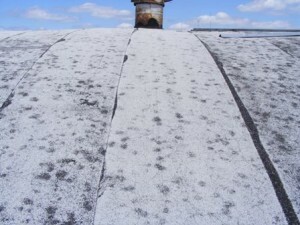 Often, roof damage caused by hail is undetected until the roof begins to leak. Undetectable hail damage is referred to as Latent Hail Damage. Latent Hail Damage is the unseen damage created by the initial impact of hail. Left unprotected for a prolonged period of time, Latent Hail Damage can result in severe roof leaks, mold, mildew, saturated insulation and substrate damage. The SureCoat Roof System can be used to repair all levels of hail damage on metal roofs, asphalt bitumen, SPF, PVC, TPO, EPDM, Hypalon and other single-ply roof membranes. Choosing the right roof product with the proper elongation in climates prone to hail is important so that the new roofing material can move with the existing substrate and daily thermal cycles. 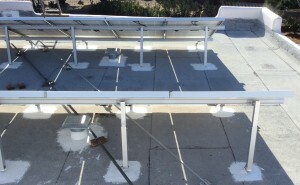 The SureCoat Roof System has a perfected elongation of 400% and sustains an elongation of 160% at freezing. The SureCoat Roof System has an advanced tensile strength of 2800 psi and exceeds FM standards for resistance to hail damage. When independently tested according to ASTM standards, the SureCoat membrane, both weathered and unweathered, did not show any signs of cracking, splitting, separation or rupture under examination even when magnified 10 times. Future hail damage to a SureCoat Roof is rare. 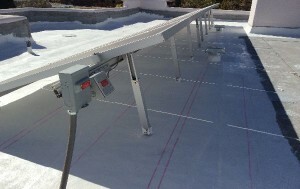 In the event that there was future damage or future penetrations made to an existing SureCoat roof, the repairs would be a minimal cost with minimal labor. The continuous bonding properties and cross-linked nature of SureCoat creates a waterproof, monolithic seal that is self-adhered and self-flashing. 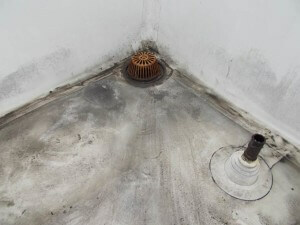 A SureCoat roof repair essentially melts into an existing SureCoat Roof without leaving a cold-joint between layers. 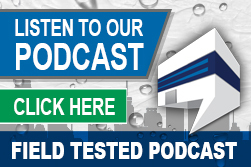 Call 877-823-7873 for an adhesion test kit, samples and pricing. Do you have Questions? Let us know how we can Support you!